A geyser requires three critical elements in order to form: a water supply, a heat source, and the proper kind of underground water circulation system. If only two of these three components are present, different features will form. For instance, if plenty of water is available but not much heat, a hot pool can form. If plenty of water and also plenty of heat exist, but not the proper kind of plumbing system, then a boiling hot spring commonly forms. Although there are many places in the world where hot springs can be found, geysers are extremely rare, largely due to the three specific requirements for their formation. The Old Faithful geyser in Wyoming's Yellowstone National Park erupts about once every 65 minutes, much to the delight of tourists. The water ejected during each eruption is at or near the boiling point, often reaches a height of 50 meters (approximately 170 feet), and has an estimated volume of 45,000 liters (12,000 gallons). Plenty of water must be available nearby to form a geyser or a hot spring. Scientists can perform many different tests on the composition of water to determine its origin. Some of these tests involve isotopes . Water is made up of bonded oxygen and hydrogen elements. The first element, oxygen, comes in different forms, called isotopes. These isotopes can sometimes tell the history of the water. Hydrogen, the other element in water, also takes different forms, and it, too, can provide information about water. For instance, scientists have used these methods to determine that water in geysers and hot springs often is several hundred years old. Isotopic studies also indicate that most of the water found in a geyser system is meteoric water (atmospheric water reaching the Earth as precipitation). The water of some hot springs is pleasantly warm, and may be frequented by bathers who want to enjoy a relaxing sauna. * But the water of other hot springs can be too hot to touch. At Yellowstone National Park, for example, boiling pools of water sometimes can be seen above the ground surface. Pools of boiling water also can lie underneath a thin crust, hidden from view. These hidden pools are why signs at Yellowstone warn visitors to remain on marked trails where boardwalks protect them from sinking into the hot waters just under the crust. For the water of hot springs and geysers to become so hot, it must be near a heat source. These high temperature regions of Earth's crust can be understood by considering plate tectonics. The Role of Plate Tectonics. Volcanoes erupt enormous amounts of very hot lava . Many geyser fields occur in areas like this and lie above pools of hot magma (molten rock) that are the heat source for geysers and hot springs. It is known that geyser fields like the ones in Yellowstone National Park lie above what are called "hot spots." Hot spots are areas where a very hot mantle is rising beneath the Earth's crust. At shallower levels, the plumes partially melt to form basalt magma. Sometimes this magma erupts directly to the surface to form volcanoes, like in Hawaii. * In other places, the occurrence of the plume and magma near the base of the crust cause the crust to melt, forming rhyolite magmas, like in Yellowstone. It is believed that today's Yellowstone National Park was located above a hot spot, and volcanic activity was common there many thousands of years ago. Over time, the North American plate has moved so that Yellowstone is no longer above a hot spot. However, evidence indicates that magma may still exist at depth. As a result, a large heat source for hot springs and geysers still exists. Geysers need an underground plumbing system that allows subterranean hot water to rise to the ground surface. In addition, geysers that shoot tall columns of water must have a special kind of plumbing. It is easiest to think about these plumbing systems as big caverns of boiling water, or geyser reservoirs, below Earth's surface. Sometimes, as with Old Faithful, these reservoirs contain a narrow pipe that connects them to the surface of the Earth. Other geysers possess wider pipes that connect the reservoirs to the surface. In these examples, the eruptions are usually not quite as violent. Sometimes a geyser will have many different reservoirs that empty out systematically during an eruption. It is particularly interesting to think about why geysers like Old Faithful erupt, shooting out tall columns of water at regular intervals. What usually happens is that some groundwater circulates deep, often 1 kilometer (0.6 mile) or more, through the Earth's crust and becomes heated. This water travels up to a geyser reservoir and mixes with the cooler water from shallow groundwater in the reservoir. Because a heat source is present, the reservoir also continues to heat as it fills. Steam bubbles rise out of the water and move up the pipe that connects the reservoir to the Earth's surface. If a constriction exists in the pipe, like a kink in a garden hose that prevents the water from coming out, the steam bubbles are caught. Pressure builds as more gas bubbles begin to rise and then become trapped at the constriction. When the pressure becomes too great, the whole system erupts and water shoots out violently, emptying the reservoir and forming tall columns of water. In other types of pipes that do not have a constriction, the geyser does not become very tall because not much pressure builds up in the pipe. SEE ALSO Earth's Interior, Water in the ; Fresh Water, Natural Composition of ; Fresh Water, Physics and Chemistry of ; Geothermal Energy ; Groundwater ; Hot Springs on the Ocean Floor ; Hydrologic Cycle ; Isotopes: Applications in Natural Waters ; Life in Extreme Water Environments ; Plate Tectonics ; Springs ; Volcanoes and Water . Allen, Eugene Thomas, and Arthur Louis Day. Hot Springs of the Yellowstone National Park, Publication 466. Washington, D.C.: Carnegie Institute of Washington, 1935. Bryan, T. Scott. The Geysers of Yellowstone, 3rd ed. Boulder, CO: University Press of Colorado, 1995. Rhinehart, John Sargent. Geysers and Geothermal Energy. New York: Springer-Verlag, 1980. Whittlesey, Lee. Death in Yellowstone. Lanham, MD: Roberts Rinehart Publishing, 1995. Geysers, Fumaroles, and Hot Springs. U.S. Geological Survey. 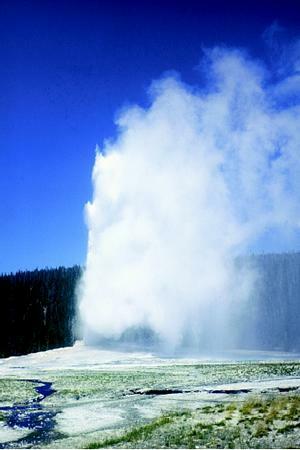 <http://pubs.usgs.gov/gip/volc/geysers.html> . Infrared Yellowstone Gallery. Infrared Processing and Analysis Center (California Institute of Technology) and Space Infrared Telescope Facility (National Aeronautics and Space Administration, Jet Propulsion Laboratory). <http://sirtf.caltech.edu/Education/Yellowstone/gallery.html> . Yellowstone National Park: Geothermal Features and How They Work. National Park Service. <http://www.nps.gov/yell/nature/geothermal/index.htm> . A small number of careless tourists to hot springs and volcanic lakes have been seriously injured, and some have died, when they fell or in some cases deliberately dove into the heated waters. Some people mistake a hot pool for a warm one, not realizing that springs can have temperatures approaching 99°C (210°F) At least nineteen deaths and over one hundred injuries have occurred in Yellowstone National Park. Consider an automobile stalled along the road with steam gushing out from the radiator. All cars have a warning on the radiator cap: Do Not Remove When Engine is Hot! This is because removing the cap on a hot engine may cause the otherwise calm coolant system to erupt like Old Faithful. People have received serious burns for ignoring this warning. So why does this occur? Recall that natural geysers operate by heating water to high temperatures—temperatures that, because of the increased pressure underground, exceed water's boiling point (100°C or 212°F at sea level). When the pressure is released, the superheated water flashes to steam and erupts. The same thing happens in a car's coolant system. The coolant system is pressurized so that water can remain liquid at the elevated temperatures within the car's engine. In addition, the antifreeze mixed with water in the radiator slightly raises the boiling point of water. Under normal operating conditions, the water–antifreeze mixture in the car is sub-boiling, between 71°C (160°F) and 88°C (190°F). However, if the engine is overheating, the temperature may increase to more than 121°C (250°F) within the pressurized cooling system. If the radiator cap is removed under these conditions, the pressure rapidly drops and the water finds itself way above the boiling point; it then flashes to steam and erupts through the top of the radiator, producing an "auto geyser." * See "Earth's Interior, Water in the" for a photograph of a scientist sampling geyser water. * See "Fresh Water, Natural Composition of," "Life in Extreme Water Environments," and "Springs" for photographs of natural hot springs. * See "Plate Tectonics" for a photograph of one segment of the San Andreas Fault. * See "Springs" for a photograph of a mudpot. * See "Volcanoes and Water" for a photograph of a Hawaiian volcano. I love this website!! It is so awesome!! Thanks so much for your information. this a very cool article but i have some complaints first of all geysers are amazing sights but they are not hot.